I am sure that everyone has seen the commercial where users of a specific brand of smartphone are passing a video back and forth by simply touching the devices together. It is a very slick feature that obviously makes moving files between mobile devices an easy task to accomplish. The technology being used to provide this feature is known as Near Field Communications (NFC). This same technology, which is an extension to older Radio Frequency Identification (RFID) technology, is also being integrated in other facets of our lives under the banner of convenience. Unfortunately, like anything where convenience is the priority, there are some potential security issues that the security community has been pointing out for years. In this case we are talking about “Tap to Pay” credit cards, transit cards, and other cards that use NFC to broadcast payment information to payment terminals. 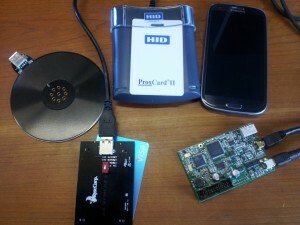 As previously mentioned, NFC is an extension to RFID technology. RFID technology, typically used to track inventory, is (I am over simplifying here) essentially a small radio transmitter that requires little to no power. The main difference, which according to many NFC vendors is a security feature, is that RFID allows for a longer range transmission than NFC. Essentially NFC will work when the devices are inches apart while RFID can be meters apart. If you want the real geeky details on exactly how NFC works I suggest that you give the ISO standard (ISO 18092) a read. To read a NFC transmission or even an RFID one for that matter one simply needs to have a receiver that is within range of the transmitting device. I would like to tell you that this transmission is performed over cryptographically secured channels or that only an authorized receiver may pick up the transmission but unfortunately, this is not always the case. This week we had an opportunity to talk with KOMO TV News Reporter Matt Markovich about NFC technology and some of the risks it presents when used as a payment mechanism. I would say that my impression of Matt was that he is more technical that most reporters I have worked with in the past as when he approached Leviathan for assistance on his story, he already had a working test case that helps prove the threat. What Matt was proving (video below) was that this technology of convenience is not secure from an eavesdropper or interception. Essentially, a “bad guy” can build his own receiver and as long as he is within the necessary range read the transmission coming from the NFC enabled card. In Matt’s test case, he uses Visa credit cards however, with a bit of customization work this can be extended to read other types of NFC enabled cards such as transit passes, and door locks. When watching the video remember no vulnerability is being exploited this is simply leveraging a feature of the technology, not a bug. NFC is after all simply a radio transmitter, there is no access control or authorization required to accept that radio transmission. While a setup like this could easily and just as cheaply be built (less than 100$) to read NFC this is not exactly portable or discrete which are two things that an attacker will require due to the fact that in order to read the NFC chip the attacker must be within range which for NFC is no more than 4 inches. In addition, the above setup assumes that, even if you follow one of the many online tutorials, you must have a level of competence when it comes to building your own electronics. So, instead of going to all of this trouble and to insure a more stealthy mechanism for attack we go back to the beginning of this post and the wiz bang smartphone feature found on most Android smartphones that allows you to transfer data simply by touching the devices together. Security researchers were quick to leverage the native NFC support found in most Android phones plus the powerful features of the smartphone itself to make this attack stealthy and practical. By simply running a custom, community supported version of the Android Operating system as well as publically available apps one can turn their smartphone in to a NFC receiver and accept a transmission. Not only can one receive the transmission, which by the way contains all the data needed to “borrow” the target’s credit card details, but it can be saved and then replayed at a later date or relayed in real-time from the smartphone to make a purchase at any standard “tap to pay” terminal. This is exactly what Matt did and demonstrates in the video and explains in this article. The most common response to this sort of attack is typically something along the lines of; “yes, but you need to be within 4 inches to make this work.” In fact, this is exactly what MasterCard said in response to the KOMO News inquires; "The circumstances under which it can occur in the real world are extremely rare." This is absolutely true however thieves already have no problem performing a traditional pick pocket theft, so why not instead of actually taking the wallet simply bump in to your target and scan it. In cases like this, it is human nature to want to find someone or something to blame. Before you assume that it is once again those “evil hackers” or organized criminal rings that are responsible remember – this is a feature not a bug. The demonstration as done by Matt in the video is simply leveraging an existing feature. This means that if you absolutely must find someone to blame, then you must pick whomever is responsible for implementing such an insecure way to transmit payment data. Yes you guessed, the Payment Card Industry (PCI). Let’s be clear, this “vulnerability” exists due to the fact that convenience has outweighed security. The PCI wanted a way to insure that consumers can quickly pay for items without spending the extra few seconds fumbling with your wallet and counting that dirty paper cash stuff that no one seems to use anymore. Could the Payment Industry implement NFC technology in a secure way? The ISO standard does outline various provisions that may add security to the implementation however, considering the scale of this implementation there may be real world operational and technical hurdles that prevent this from happening. Unfortunately, we will see more and more of this technology however, one of the best defenses today is to simply call your credit card company and ask them to issue you a card that does not support “tap to pay” or any other NFC technology. Today, card issuers are honoring this request, of course eventually they may stop however, if enough consumers reject the technology perhaps change can be forced.